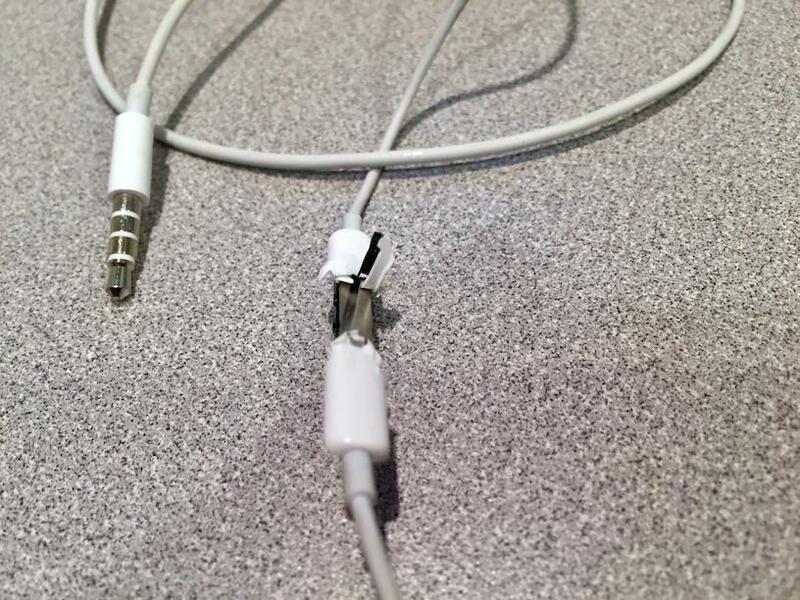 An iPhone user can use the Apple wired headphone switch to perform several actions, including ending a phone call. This project makes an electrical breakout, allowing another switch or a programmatically controlled relay to perform these actions. This can be used for automated testing of iOS apps that make phone calls. The project could use an actual headphone or a fake headphone. I prefer an actual headphone, the earphones and microphone can still function. Also it may be more compatible with phone hardware and software. Please note if you do this you could accidentally damage the phone or yourself. If you are careful I think the risks are low, but no warranty! 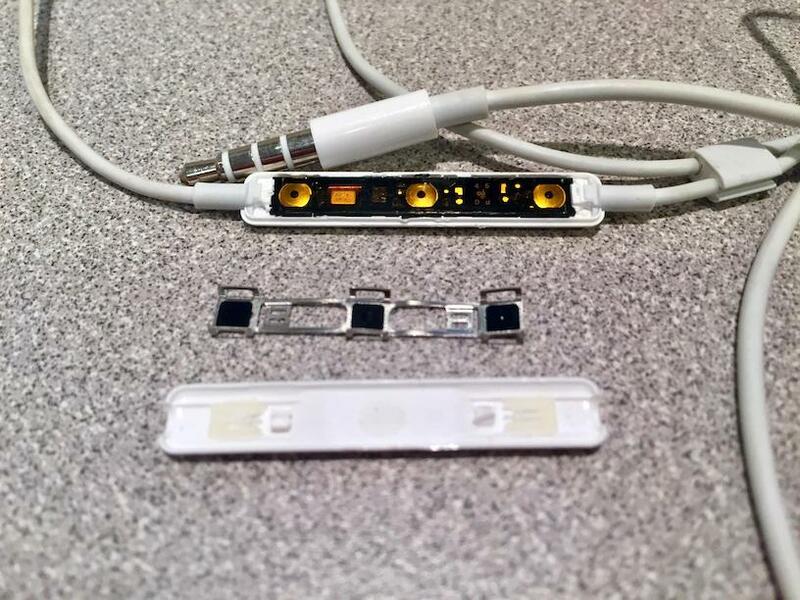 The headphone plug has 4 contacts. The phone interprets a resistance of roughly 5 kohms between the microphone input and ground as a microphone. Clicking the center switch on the headphone cord momentarily shorts the microphone input to ground. First I pried and cut into a headphone switch, thinking to splice directly into the switch. This exposed a thin circuit board. The top was covered with metal strip, insulating film and thin metal domes. I didn't expose switch contacts. The bottom was covered with a thin black strip of something(!) and a metal strip. I didn't expose switch contacts. I felt even if I did get to the contacts, they would be too small to solder to easily. So I tried another approach. 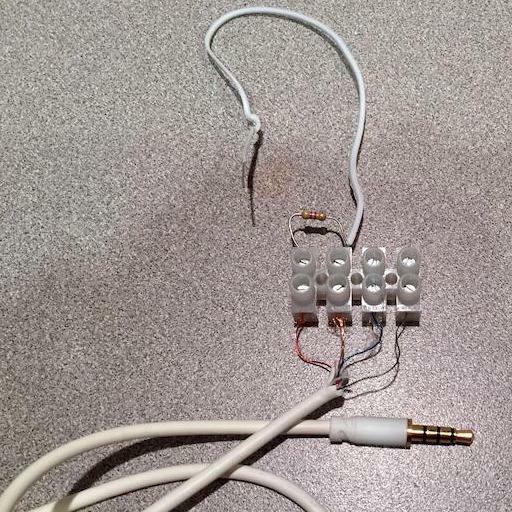 I got a headphone extension cord, cut off one end and attempted to solder some of the wires. The wires were very fine and it was difficult to mechanically strip the insulation. Soldering didn't work, too contaminated. I made a fake headphone using a screw terminal strip and a 5 kohm resistor from microphone input to ground. After starting a phone call, manually shorting the microphone input to ground ended the call. Finally I realized the switch can go between the headphone plug and the phone jack. The switch box connects an Apple wired headphone to a 4 conductor headphone extension cable. 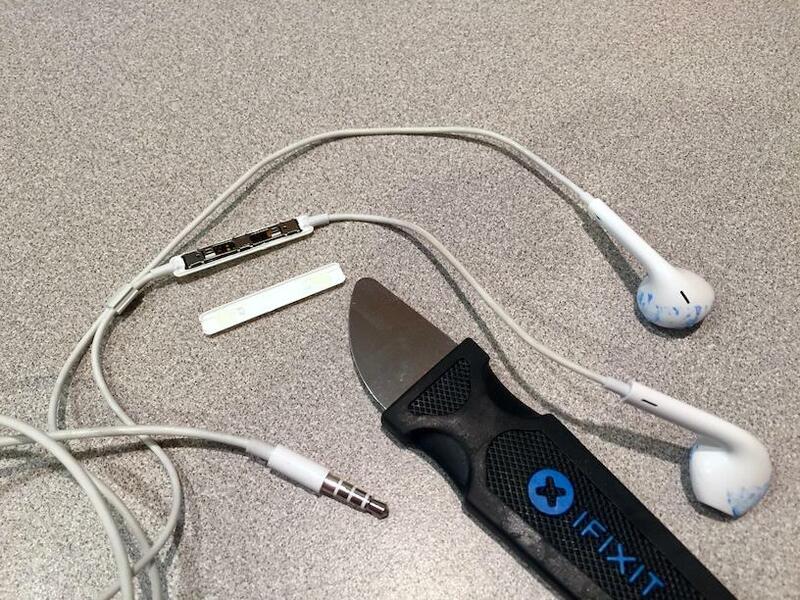 No need to cut into the headphone. Much easier! 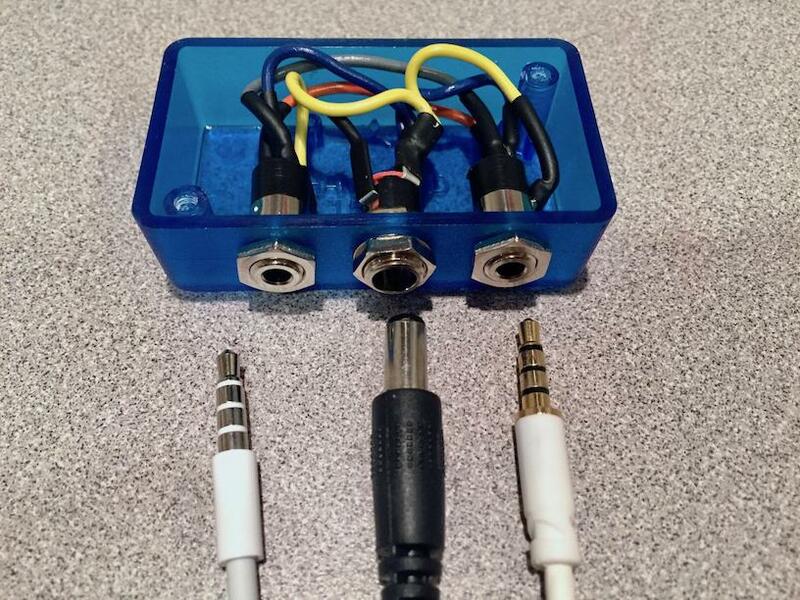 The switch box breaks out the microphone contact (farthest from the headphone plug tip) and the ground contact (second farthest from the headphone plug tip) to a coaxial jack. An external switch or programmatically controlled relay may plug in to this jack.